If you have a wet basement, moldy crawl space, sinking sidewalk, or settling foundation you need an effective solution from a company whose expertise, reliability, and workmanship is second-to-none. That's exactly what you will get with us. Have questions? Just let us know and we will be happy to explain what is wrong and how we will fix it ... we are here to help. If you are dealing with basement, sinking or uneven concrete, crawl space or foundation problems and live in Chapel Hill, Winston-Salem, Greenville or nearby give us a call. Regional Foundation Solutions, (formerly Regional Basement Systems) is your local basement waterproofing, crawl space repair, concrete lifting, and foundation repair contractor of choice in Raleigh, NC. 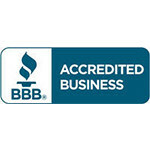 We are accredited with the Better Business Bureau and maintain a consistent A+ rating. We offer quality basement & foundation work while providing outstanding service to each and every one of our customers. We offer free, no-obligation quotes to homeowners throughout our service area. Each quote includes a free on-site inspection, a written quote, and a copy of our 88-page, full-color basement, crawl space, or foundation repair books.You'll be impressed with our no-pressure approach, and especially by the knowledge, courtesy, and professionalism of our staff. "Brandon B. Was an excellent technichian. Good trouble..."
"Ricky Did a Great Job! Regional is always professional"
We understand that building strong customer satisfaction and relationships are critical in turning satisfied customers into raving fans that provide us with testimonials, references, and referrals. This is why satisfaction and customer service are two of our highest priorities. As a matter of fact, many of our customers are referrals from one of our previously satisfied customers. We have grown, and continue to grow, as a leader in the basement waterproofing and foundation repair industry offering unsurpassed products, services, warranties, and overall satisfaction. We don't just fix basements, we help people! We service homeowners and businesses in Raleigh, Durham, Greenville, Cary, Chapel Hill, Rocky Mount, Wilson, Apex, Henderson, Elizabeth City.